Just found this for a buck at a yard sale and I've never seen such an elaborate cleaning cassette. There's a small compressed air canister that actually sprays Freon onto the cotton-like tape from within the cassette with a push of the red button on the bottom right. 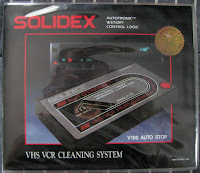 An electronic eye also in the cassette syncs up with a VCR's photocell sensor to tell the unit to stop playback and beep to signal it's done cleaning. 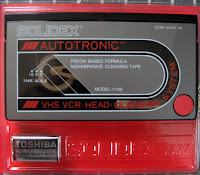 A 9V battery inserted into the back of the cassette powers these operations. High tech '80s!